The American Hospital Association’s (AHA) Health Forum has named UnityPoint Health a 2017 “Most Wired Advanced” Health System. The Most Wired Survey and Benchmarking Study recognizes hospitals and health systems for excellence in information technology (IT). Most Wired Advanced recognizes organizations that achieve at least a level three, out of five, in all four focus areas evaluated. 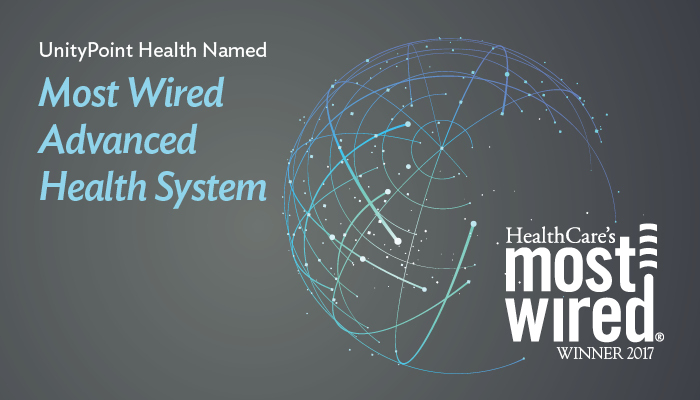 UnityPoint Health achieved “Most Wired” status five years in a row, prior to being recognized as advanced this year. Grundy County Memorial Hospital, a UnityPoint Health Community Network Hospital, has again received the honor of “Most Wired” for 2017. Technology is making it easier for patients and providers to interact, thus improving communication, safety and patient-provider relationships. According to the survey, Most Wired hospitals and health systems are using smart phones, telehealth and remote monitoring to create more ways for patients to access health care services and capture health information. New tools are helping patients become more actively involved in their care and maintaining their health, according to results of the 19th Annual Health Care’s Most Wired® survey, released today by the American Hospital Association’s (AHA) Health Forum. Innovation in patient care embraces emerging technologies and underscores the need for secure patient information exchange. Hospitals have increased their use of sophisticated IT monitoring systems to detect patient privacy breaches, monitor for malicious activities or policy violations and produce real-time analysis of security alerts. Most Wired hospitals are transforming care delivery with knowledge gained from data and analytics. They are investing in analytics to support new delivery models and effective decision-making and training clinicians on how to use analytics to improve quality, provide access and control costs.